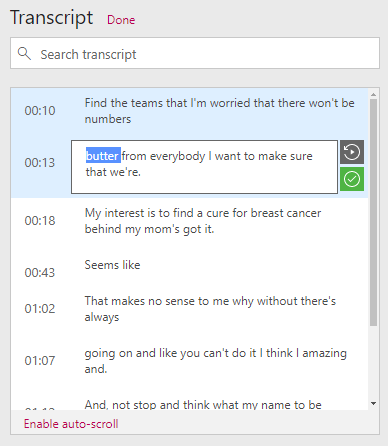 The transcript window makes it easy for viewers to read a video's transcript while watching. 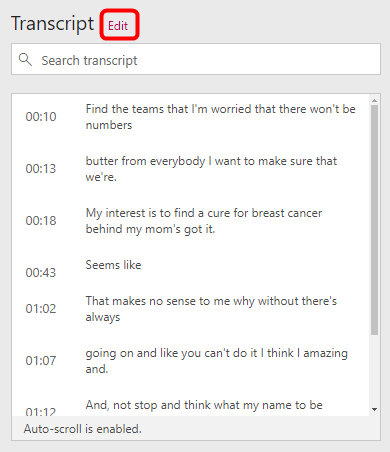 If you are the owner of a video, you can use the transcript window to edit the words in the transcript. In the transcript window, click Edit. When you're in edit mode, tyou can select one segment at a time for editing. There are two buttons that appear next to the active segment. Use the gray first button to replay the current segment, helping confirm edits by relistening to the audio. Use the green second button to deselect the current segment when you are finished editing. After you are finished with your edits, click Done.